Within the space of a few moments, Jagmeet Singh became one of Canada’s most admired politicians. 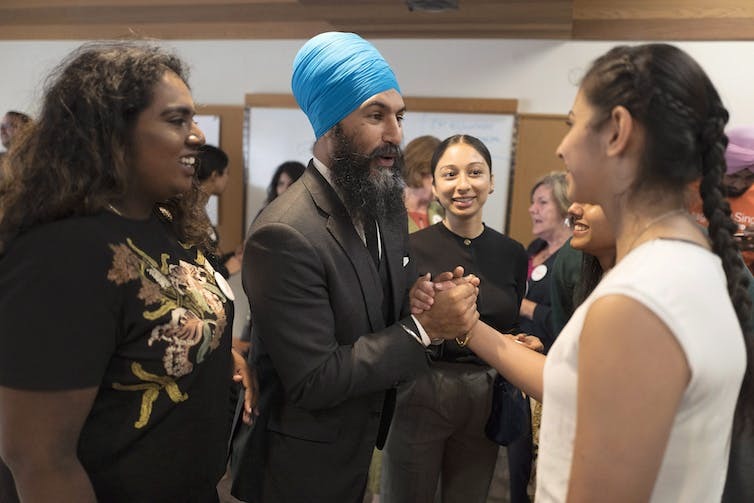 His cool-under-pressure reaction to being confronted by an angry heckler is just one of the reasons Singh is considered to be the favourite contender for leadership of the federal New Democratic Party. A video of the Sept. 6 incident at Singh’s campaign event in Brampton, Ont., went viral and has been viewed millions of times in Canada and around the world. Moments into the event, an angry white woman interrupted Singh and shouted Islamophobic and vitriolic statements at him, and physically gesticulated, demonstrating her feeling of entitlement — to space, voice and position - in relation to others at the event. In the face of a racist rant, Singh remained calm. The dramatic events at the Sept. 6 meeting demonstrates something about Singh, as a person and as a candidate. It also points to new undercurrents of religion and spirituality and its role — not only in Canadian politics, but also in the leadership race for the NDP. Singh’s campaign and potential leadership arrives in a climate of increasing hatred, fear and division. His call for universal love is coherent with Sikhism, which challenges the division between daily life and a devotional love that guides all thought and action. How does the language of love and courage relate to a New Democratic Party trying to find its way in a shifting political landscape? Singh’s outward appearance solicits questions from some Canadians — as in the case of the heckler — regarding his secular position: To what degree does Singh’s religion relate to his policy ideas or conduct? Canadian political institutions and traditions are imbued with Judeo-Christian values and symbols. Yet the separation of church and state maintains religion does not dictate the making of policy and law. However, in the game of politics, courting ethno-racial, national and religious identified voters has become a central art of party campaign strategists. Political parties of all persuasions have had to navigate this division in a variety of ways. In Canada, the left social democratic tradition, represented now by the NDP, has had less experience with faith-based movements and the religious identity of its leaders than their right-wing counterparts and left-leaning parties elsewhere in the world. Singh’s leadership challenge will likely change that. While Singh is positioned as a secular politician, his ethos, sense of justice and formation of his identity is connected to a Sikh practice. The very essence of the message of universal love and courage is embedded in a Sikh devotion, rather than a secular idea of loving all humankind. Practising Sikhism defines a way of life — one that is contemplative, meditative and committed to spiritualism and positive actions. To understand the contemporary role of religion in politics, we need to look at one of our turning points: 9/11. The attacks on New York City and the Pentagon served as a marker of the time foreign and domestic policy in North America was called upon to name Islamic terrorism as a universal enemy. Once North America and other western governments embraced the rhetoric of a civilization divide, the psyche of liberal democratic nations split apart. The already tenuous divide between the religious and secular began to rupture further. This reinforced a binary division and emboldened a powerful discourse of racism and Islamophobia. The basic premise is that Islam represents something universally distinct from Christian belief systems. This discourse of racism and difference has gained strength and societal control through the election of conservative governments with moral platforms that build on fears and anxieties of susceptible citizens. Sixteen years of corrosive discourses since 9/11 has led to: Us vs. Them, the Clash of Civilizations and racism. We are now at the point of the normalization of white supremacy. It is no longer an oddity or a left-wing conspiracy theory to discuss the presence of fascism and neo-Nazis — these are events widely circulated in our social media feeds and featured during the evening news. Islamophobia and racism are often understood to be twinned structures of oppression. In many ways they are, but there are complex differences between them. They disseminate and exist in different political, cultural and social taxonomies. Islamophobia operates through systems of stereotypes, often misunderstanding or misrepresenting the traditions, religious practices and customs of highly diverse ethno-national and racial communities. Islamophobia has been manufactured in multiple ways in society through popular culture, media, policy and criminalizing targeting Islam and Muslims. Racism is a larger systemic operation of power denigrating one race while validating or elevating another. When the Harper Conservatives were in government, they attempted to map onto Canadian national values a form of social conservatism. This was articulated through a distinction between Canada and the “barbaric cultural practices” of others. The clear lines that were being drawn between what Harper referred to as “old stock Canadians” during a 2015 federal leaders’ debate brought into discourse front and center the relationship between white supremacy and Islamophobia. It connected the dots between a normative white Christian Canadian identity that could stand against the racialized others. 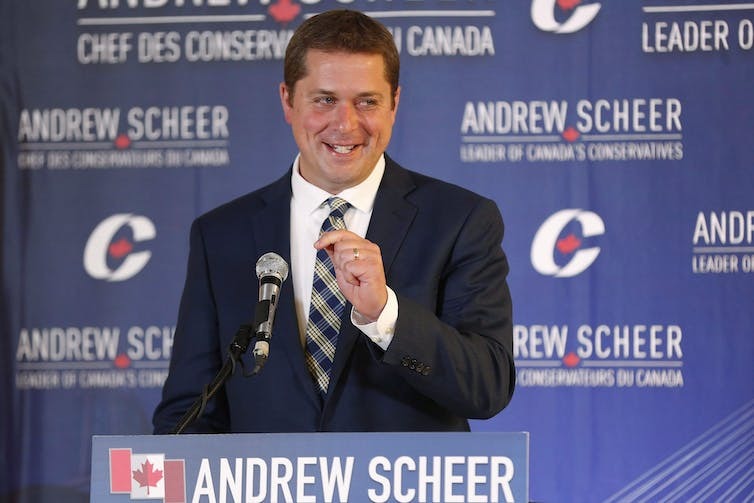 Now the Conservative Party has a leader who proudly accepts the label: “Harper with a Smile.”“ Andrew Scheer has the support of social conservatives in the Conservative Party. He has steadfastly supported free speech over the condemnation of Islamophobia and was absent during the House of Commons vote for the Anti-Islamophobia Motion M-103, overwhelmingly passed in the House of Commons. Singh said his ability to remain cool under pressure was largely owed to his experience of being a brown, Sikh and turbaned man, growing up in the 1980s in Brampton, Ont., just northwest of Toronto. His past experiences of religious and racist intolerance helped to fortify him against racist language and assault. In the moment in which the racist woman yelled at him, she assumed he was a Muslim. Many wondered why Singh did not attempt to correct her misconceived perception; he is not a Muslim, but rather, a Sikh. Suggesting such a distinction in the moment, he said, would only further the misunderstanding that somehow being Muslim means such treatment is considered justifiable. His reaction, he said, should not be to proclaim his religion. By not correcting this misconception, Singh was acting in solidarity against Islamophobia. Sikhs have been affected throughout the post-9/11 discourses of Islamophobia, mainly because of this misunderstood identity. In the U.S., and elsewhere, there has been a rise in hate bias attacks against Sikhs, with the 2012 Oak Creek, Wis., shooting as a visible example. While there are those who, in the similar vein as Singh, have sought to challenge Islamophobia by standing in solidarity, there have also been many instances where Sikhs in America, the U.K. and Canada painstakingly distinguish themselves from Muslims. However, in countless examples, when Islamophobia is experienced in the public sphere against properly identified Muslims, there has been a lack of outcry. In Canada, the shooting deaths in Quebec’s Sainte-Foy’s Mosque, in which Azzedine Soufiane, Khaled Belkacemi, Aboubakar Thabthi, Abdelkrim Hassane, Mamadou Tanou Barry, and Ibrahim Barry were killed, was unmistakably an act of terrorism. Canadians across the country mourned this tragedy. And yet was it recognized as an act of terrorism against the citizens of this state? The day-to-day effects of Islamophobia have led to many Muslims living with heightened experiences of fear and not knowing what they might encounter on a walk to school, a day at work or even waiting for a bus. The left social-democrats of the NDP hold steadfastly to their conception of justice, fairness and equality in a secular world. The ways in which people are encountering the public today, however, is seemingly much murkier than these stark divisions. The issues of racism, religious intolerance and social justice are not central issues for any federal political party. These issues, however, should no longer be viewed as separate from major policy platforms including health, welfare reform, employment, national defense, national security, aboriginal relations and education. Perhaps a political leader such as Jagmeet Singh will be able to navigate these debates with an alacrity and style we have yet to witness in the Canadian political world.